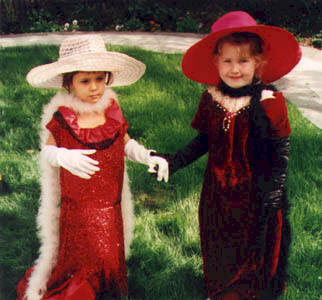 Do you remember playing dress up as a little kid? I could play all by myself or with a friend and become anyone or anything I wanted to. I would imagine being in a all sorts of wonderful places from around the world with the most magnificent clothes and shoes. I would be a famous actress or royalty, a teacher or even the best mom ever. Playing dress up was one of my favorite activities. I loved collecting all kinds of items to create my most wonderful costumes. Children's imaginations can create just about anything out of virtually nothing. leftover fabric can become a royal cloak! 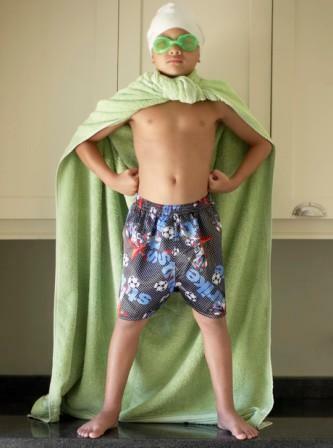 Play acting is a wonderful way to stimulate your child's imagination. Giving them the opportunity to add homemade costumes to their playtime, makes playtime even more fun! Incorporating nursery rhymes and those fun characters into their play allows for more learning in a fun fashion. So why not give them nursery rhyme themed costumes to allow them to act out the rhymes? Nursery rhyme costumes can easily be made with a bit of creativity. For little ones, the costumes are heavily dependent on props. This makes it easy to pull together a simple and adorable costume. You can dress them in clothing they already own and just add a little make up or face paint and a prop or two. And there you have it, a Butcher, a Baker, a Candlestick Maker, all with just a few props. For this fun trio, a package wrapped in white butchers paper, a baker's hat and rolling pin, and a tapered candle are all it takes to have this nursery rhyme come to life. 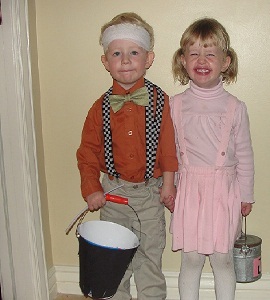 For another nursery rhyme costume, try dressing a little couple in play clothes with a bandage and water buckets to create the characters of Jack and Jill . Children's imaginations can be just as stimulated with store bought costumes as homemade. Either way, costumes go a long way to getting those creative juices and little imaginations churning like crazy. Nursery rhyme costumes can be used for every day play, a preschool activity, a fun birthday party activity or theme and of course, for Halloween fun! There are so many nursery rhyme characters that the ideas can be limitless. They can be all sorts of animals from kittens and lambs to bears and lions. Your little one can be a king, queen, princess or a knight, a farmer, sailor, old man or shoemaker. A great way to get started is to start collecting all sorts of items that children can use to put together their own character costumes. My grandchildren's favorite gift was a trunk full of all sorts of costumes and costume accessories. These store bought costumes, in a variety of sizes, were purchased on clearance after the Halloween season. They spend countless hours mixing and matching to make some extraordinary costumes. I've seen pirate fairies and vampire princesses dance through the family room. They love spending lazy weekend mornings making up play stories in their newly created outfits. You can enjoy your own children's or grandchildren's play acting by creating their own costume wardrobe. Face Paint - face paint recipes from items in your kitchen! Baker's or Muffin Man Costume - This costume works for several great nursery rhymes. 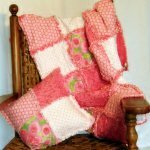 Bonny Lass - perfect for that special little girl! Chicken or Rooster Costume - the most adorable little chick! Farmer Costume - so easy to have your own Old MacDonald! Humpty Dumpty Costume - Easy for your little egg! Jack or Jill Costumes - Great idea if you have both a boy and a girl to dress up. Ladybug Costume - So easy to make this cute as a bug costume. Lamb Costume - Bo Peep's should've been this cute! Mary's Little Lamb Costume - Mary has lambs too! Little Bo Peep Costume - A shepherd's hook and a lamb complete this costume. Little Boy Blue Costume - This costume can be pulled together virtually from your little one's closet. Little Miss Muffet Costume - Add a spider, bowl and spoon for Miss Muffet. Mary Had A Little Lamb Costume - Just a few props and you have the cutest Mary. Mary Quite Contrary Costume - so easy to let her garden grow! Peter PumpkinEater Costume - get Peter and his wife! Princess Costume - pretty enough to go to the ball! Scarecrow Costume - Easy to make scarecrow costumes from items around the house! Spider Costume - Here's an easy to make companion for Little Miss Muffet. Wee Willie Winkie Costume - an easy and adorable costume. Zebra Costume - counting zebra stripes!